The app shows wrong limits? This can be changed very easily. Here you can read how to do it. 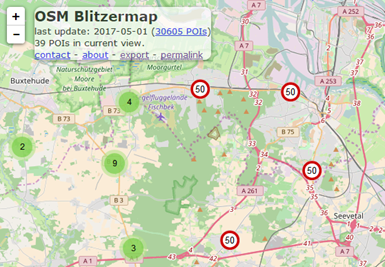 To get an overview of which roads are already provided with entries of Maxspeed in the OSM card, you can call the map of the company ITO. This is updated regularly. Own changes are included after about a week in this map. Before anyone criticizes my app, I would ask you to inform yourself in advance, which speed is entered in the OSM card. In case of incorrect display of the app, I will of course try to fix the error as soon as possible. Another option for checking and modifying the entries in the OSM card is the website of the OSM card. You can start immediately with the green button "Edit map". If you do not have a user account yet, you simply put it here. 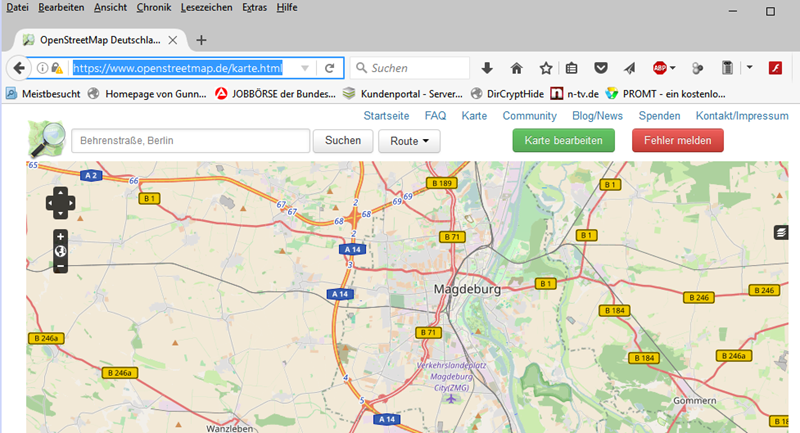 The user data can then also be used in all other OSM editors. 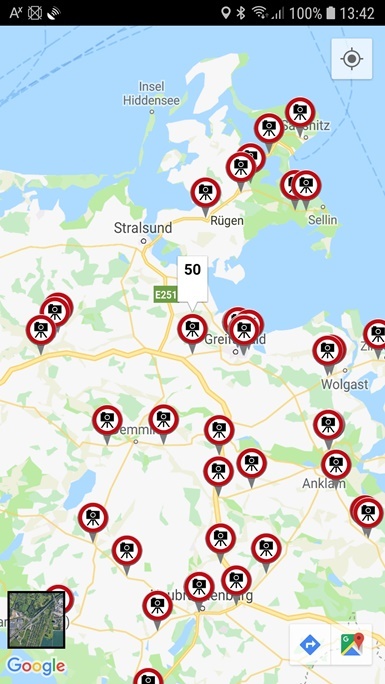 If you zoom far enough into the map, you get into edit mode, where the streets can be selected. The current data is displayed in a table on the left side and can be changed easily. For the app, only the values ​​of the maximum speeds are interesting. In case of changes, it is often necessary to divide roads in order to put the beginning of a speed zone in the right place. The tools are available directly in the mouse menu. The value "maxspeed" is entered directly into the table on the left. There is already a field available. 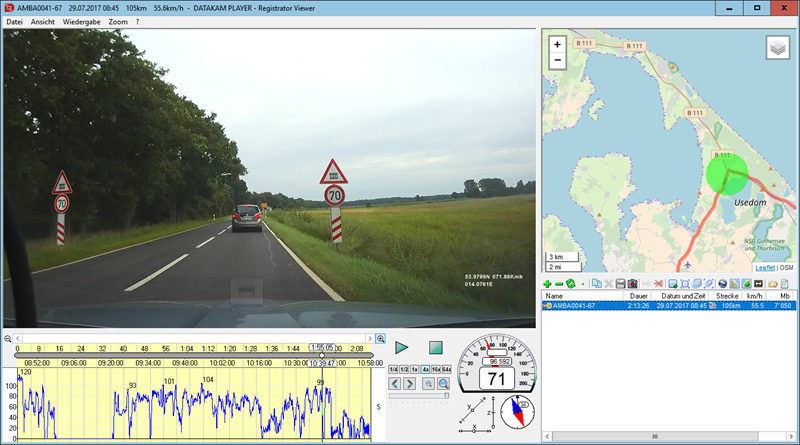 The values ​​"maxspeed: forward" and "maxspeed: backward" (for different speeds in the different directions of travel) must be added below at "all properties". "Maxspeed: forward" applies to the road in the direction of the arrow and "Maxspeed: backward" to the opposite direction. The best way to start is to look at existing entries in the map. It understands the principle very quickly. After one or more changes, the data must still be saved. They are registered in the official OSM database and are visible to all users of the OSM card in a short time. When making changes, you should be very careful and save them only if you are sure of your cause. 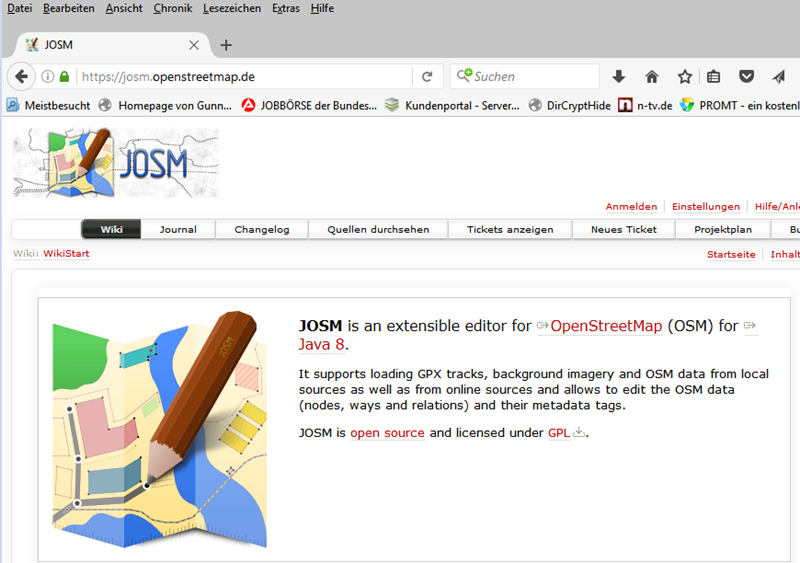 There are plenty of sources on the Internet with instructions for editing the OSM database. If in doubt, you can also get advice in the OSM forum. In this editor, you can set the maximum speeds for the streets to be displayed in color. This greatly facilitates the work of changing entries. As an example, I have chosen a junction of a dual carriageway (with two independent lanes) with a local road. In this explanation, you can see very well how the app works. At this intersection, the entries for the intersecting local road are missing. 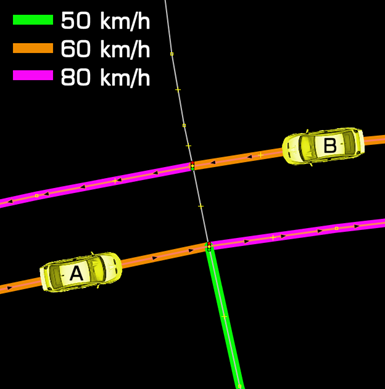 For vehicles A and B, the app sets the top speed to 80 km/h shortly after the intersection. This information no longer changes independently in which direction the vehicles are moving. In all other directions, speed "unknown" is displayed for both vehicles. Now a side street was supplemented with the entry 50 km/h. As a result, there are changes in the behavior of the app. Vehicle A must now first cross the intersection. If you continue straight ahead, you will see a speed of 80 km/h, turn right and 50 km/h. If it turns to the left, the display shows speed "unknown". With vehicle B, something changes only when turning left. Shortly after the display "unknown", the display switches to 50 km/h. In this picture, the connection of the two highways was set to 50 km/h. Thus, the display for vehicle A briefly turns left 50 km/h, but then goes to "unknown". For vehicle B, the short-term switching to "unknown" is omitted when turning left. It is displayed after the change of direction immediately the 50 km/h. After the right turn, the display shows "unknown". This last malfunction in the vehicle B is only eliminated by entering the last missing information. 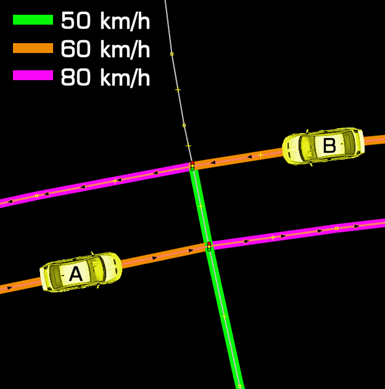 In this picture, the app for vehicles A and B works flawlessly for all directions. 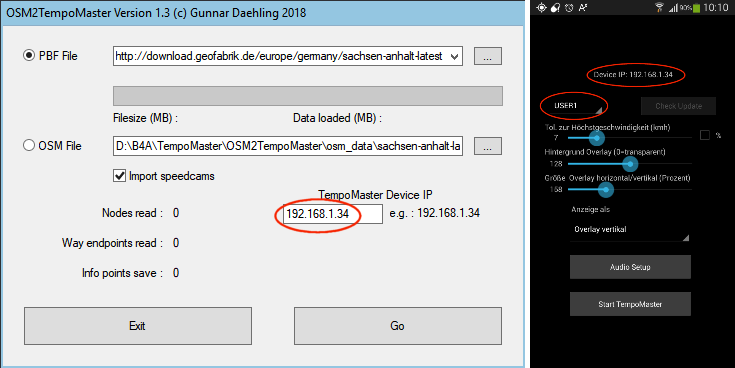 For importing OSM data and creating your own data sets, I provide the Windows tool "OSM2TempoMaster". Instructions in the form of a PDF file are included in the ZIP file. The tool does not have to be installed. The packed folder "osm2tempomaster" only needs to be stored in a location with full write access. I have described a method for the effective capture of large amounts of data in a separate PDF. To read the instructions just click on the picture below.